Bhahahaha! Oh my dog that last pic is a riot! awww, thanks you guys! This is way better than a stuffed replica! So the winner of the cute pet contest got 5759 votes! And was not even close to being as cute as Grizz! I think it was rigged! nope! Sally’s trophy is the best! Definitely rigged. 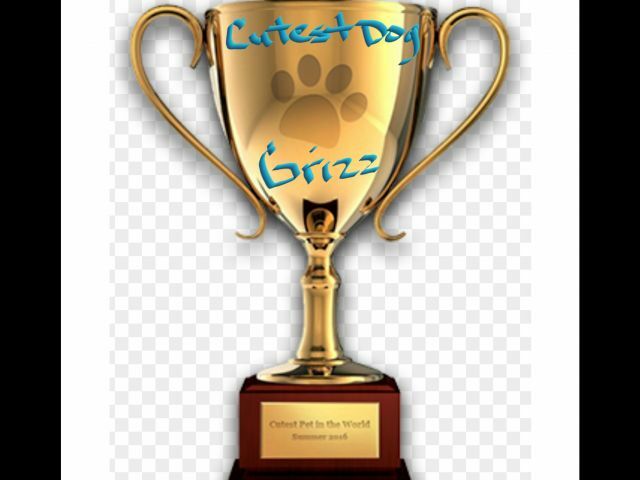 Grizz is the true champ and has the trophy to prove it. And besides, obviously the “Judges” didn’t use the legal way of counting votes….the Dogtoral vote🤣😂 Grizz would have won the Dogtoral method! Seriously, something was mighty suspicious! With that 24 hr waiting period before someone could vote again? Nah….something stinks! I’m glad that we didnt have zero votes! Don’t mess with Team Grizz! Sally, I literally LOL’d and now my co-workers want to know what’s so funny. And I think the 0-vote dogs are more proof the contest was rigged. No way any dog ever gets 0 votes. I think the “winner” stole votes from them (and probably stole from Grizz too! ).